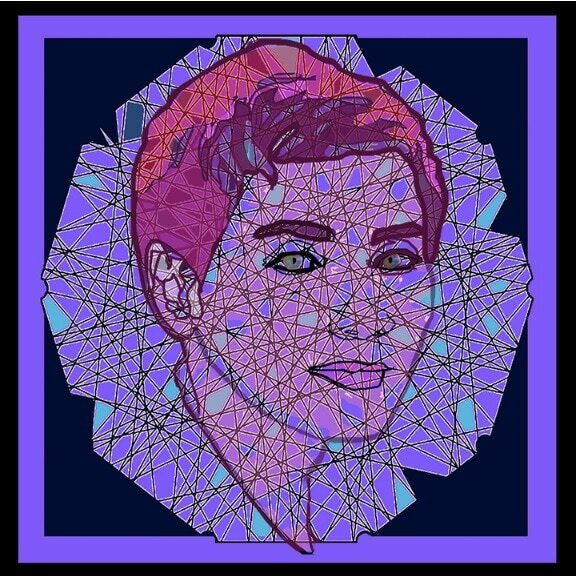 Maryam Mirzakhani an Iranian- American the first Female to win The Fields Medal in math. Anya Rubin was born in St. Petersburg. After emigrating to Israel and later Germany, the artist settled in America, where she continues to live and work. Upon the birth of her triplets, Rubin began crafting large-scale family art projects to keep the children busy. This marked the beginning of the artist’s self-taught practice, one that has flourished based on her principal work in oil paint and digital lightboxes. Rubin’s current works play with the distillation of data, breaking large swaths of information into elemental forms. Her multidisciplinary practice includes painting and labor-intensive photo editing techniques that allow patterns to bubble up from small particles of matter. A photograph that began as a snapshot of young bodies loitering becomes pared down through Rubin’s reductive techniques, exposing existential building blocks: small, amorphous shapes that hint at the atoms, molecules, and cells that underpin all life. Mixing painterly softness with biological specificity, Rubin speaks to the “life-affirming support structure” that is ever present below the surface of appearances. Rubin’s practice makes visible the adage that “all things are interconnected,” whether taken on a bacterial, physical, or spiritual level. Rubin’s work has been shown at the 2nd International Biennale of Art of Palermo 2015, (Un)Scene Art Show 2015, and Barcelona Biennale 2015. Her recent solo shows include National Arts Club Gregg Gallery, New York, NY; Alberto Linero Gallery, Miami, FL; and more. Rubin is the recipient of the International Prize Leonardo Da Vinci, Florence, Italy (2016) and has works in the collections of European Art Museum, Denmark and the Bill and Linda Gates Foundation, among others. Artist Anya Rubin was born in St. Petersburg. After emigrating to Israel and Rubin began crafting large-scale family art projects to keep the children busy. This marked the beginning of the artist’s self-taught practice, one that has flourished based on her principal work in oil paint and digital lightboxes. Rubin’s current works play with the distillation of data, breaking large swaths of information into elemental forms. Her multidisciplinary practice includes painting and labor-intensive photo editing techniques that allow patterns to bubble up from small particles of matter. A photograph that began as a snapshot of young bodies loitering becomes pared down through Rubin’s reductive techniques, exposing existential building blocks: small, amorphous shapes that hint at the atoms, molecules, and cells that underpin all life.